Obituary for Bonnie Jo (Elson) Wenrick | Cromes-Edwards Funeral Home & Crematory, Inc.
BONNIE JO (ELSON) WENRICK, 66, of Sidney passed away Thursday, March 28, 2019 at 8:53 AM at St. Rita's Medical Center in Lima. She was born on February 12, 1953 in Sidney, Ohio, the daughter of the late Chester and Roberta (Giesseman) Elson. On September 2, 1972, Bonnie married Daniel Wenrick, who survives. She is survived by two children, Amy Jo Ayers and James Daniel Wenrick both of Houston; three grandchildren, Logan Montgomery Ayers, Shelby Madison Ayers and Kayleauna Marie Elizabeth Wenrick; brother, Bill (Margie) Elson; mother-in-law, Erma (Royal) Cotterman and sister-in-law, Linda Argabright. Bonnie was preceded in death by father-in-law, Robert Wenrick and son-in-law, Scott Ayers. Mrs. Wenrick was employed by Walmart in Piqua for over 5 years. Her favorite job was being a bank teller in which she enjoyed conversing with her customers. 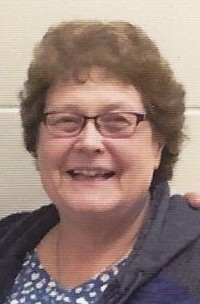 Bonnie was a 1971 graduate of Sidney High School. She enjoyed reading, playing cards with her "card club girls" and attending her grandkids sporting and school events. Bonnie was always cheering for her Houston Wildcats. She loved animals, especially her cats and chickens. Bonnie was a member of Oran Christian Church.